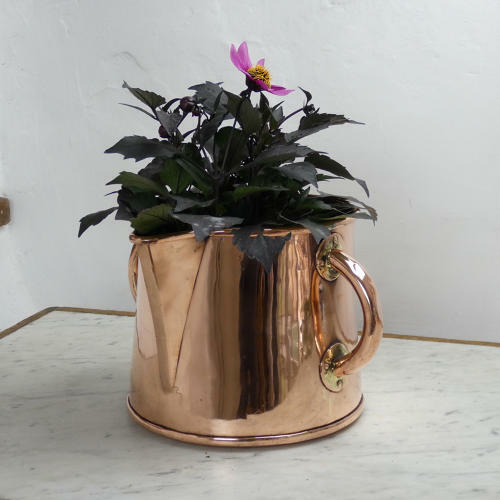 A very unusual, French copper. two handled jug. This piece is well made, from a very heavy gauge of copper, and it has a castellated seam up the side and a rolled seam the base. It dates from c. 1860 and is slightly primitive in style. It could possible have been made for use in a brewery or vineyard rather than a kitchen. The interior was originally tinned, so it was definitely for use with food, but the tinning is now too worn for it to be used again. There is very slight pitting to the copper, there are a couple of small dents, and there are two small, soldered repairs to the wired rim, all consistent with use.